This is a watch that leads you away from our contemporary dimension of time, the digital indications on our televisions, computers and smartphones, and the beeps on the radio. 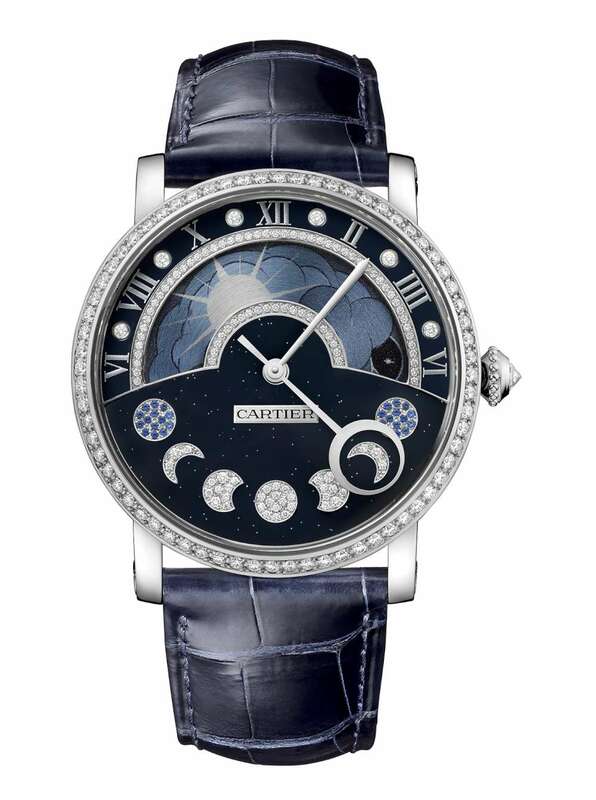 The Rotonde de Cartier Day/Night Retrograde Moon Phases takes you back to the origins of our time, the planet earth as it spins and orbits the sun, accompanied by the moon with its own silent phases. The watch has an air of mystery, and it’s not immediately obvious how it works. But it’s a good example of how a conventional movement can be treated in such a way as to create an object that looks totally different from a normal watch. The central sword-shaped minutes hand rotates conventionally around the dial, with no scale at all to read off the minutes. But we all know what 25 past looks like, right? The hours are shown by the day-night indicator in the top half of the dial. The day/night disc rotates once a day, with the hour shown by a ray of the sun during the daytime, and by a star above the moon at night. The scale is from 6 to 6, with Roman numerals for the even numbers, and diamond indicators for the odd numbers. The bottom half of the dial is entirely dedicated to the moon phase. A hand with a circular extremity runs from new moon at the far right, going through the phases of waxing to reach full moon at 6 o’clock, then waning, reaching new moon on the far left, after which the hand returns to its starting point on the right. The watch’s colour scheme heightens the sense of deep space and mystery. The dial is in dark blue enamel with flecks of gold that evoke the night sky. The two new moons are set with blue sapphires, and the other phases with diamonds. The crown is beaded at its base and is set with a diamond. The gemsetting includes 68 diamonds on the bezel, and a total of 118 diamonds and 28 blue sapphires on the dial. The strap is in dark blue alligator with double folding clasp in white gold, set with 43 diamonds. The watch is in rhodium-finished white gold, 40 mm in diameter and 12.16 mm thick, water resistance 3 bar (30 metres). 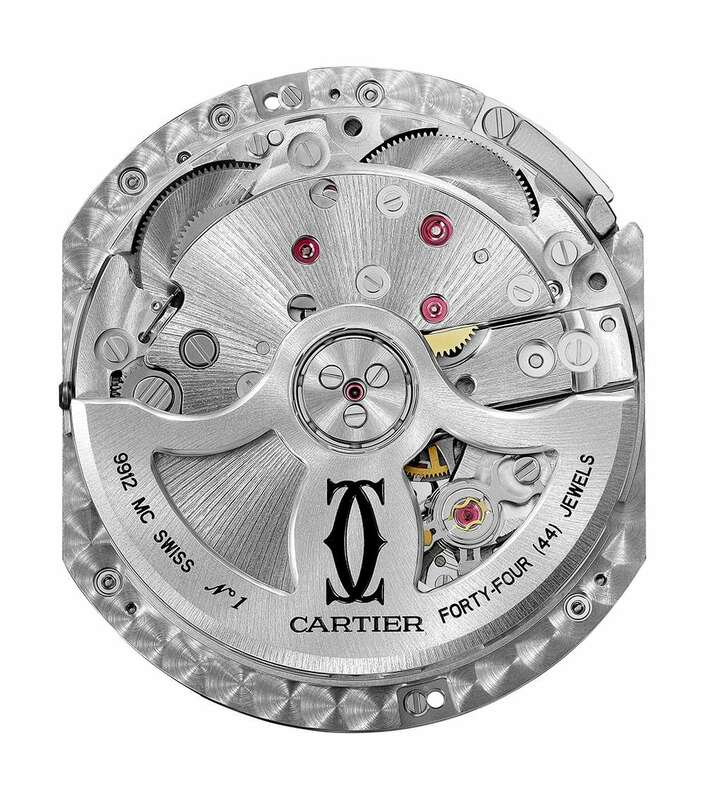 The sapphire caseback reveals the self-winding calibre 9912 MC movement, designed and built by Cartier. It runs at 28,800 vibrations per hour (4 Hertz), and has a power reserve of about 40 hours. It has 290 components and 44 jewels. 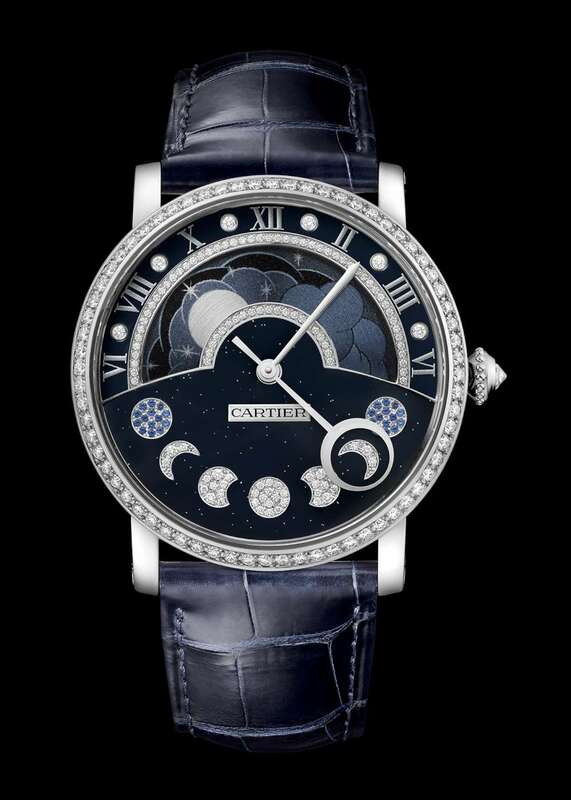 The Rotonde de Cartier Day/Night Retrograde Moon Phases, reference HPI01009, costs €75,000 plus tax. Considering that we will see a steel Clé de Cartier watch at €4,400 plus tax some time soon, Cartier spans pretty much the entire range of prices for high-end mechanical watches. More at Cartier’s website.